“Learn about issues facing families and children 6-12 in Toronto as we bring the magic of out-of-school-time programs to City Hall. A special group of 60+ children bused in from programs from across the City. Drop-in activities (ongoing), 4 pm – 7 pm, (parents, children and service providers) by the Textile Museum of Canada, 21 Toys, MAKELAB, ON After-School and HIVE Toronto. A display of creative art projects from children about why their out-of-school-time program positively impact their lives. Children and adults can learn how to use a loom from the Textile Museum of Canada and participating in 3D printing by MAKELAB. Presentation and Special Music Performance at the City Hall Rotunda, 5:30 pm. City Hall Committee Rooms transformed into program spaces featuring one of a kind program activities. Children participate in the Robot Wars and Create your Own Comic activities from 6 to 7 p.m. in the committee rooms. Please click here for a complete event schedule (pdf). Vital policy and research reports on display explaining the importance of the ages 6-12 and out-of-school-time programs. Brand new online tool to explore how many after school programs exist in each ward and what percentage of children are being served in that ward. Please click here for more info about this event. City Councillor Anthony Perruzza (Ward 8 York West), Chair of the Community Development and Recreation Committee, and Ian Edward, Chair of the Middle Childhood Matters Coalition and Executive Director of Kiwanis Boys and Girls Club, will join participants to celebrate Middle Childhood Day and to highlight the City’s out-of-school programs for children aged six to 12. City councillors and staff, doctors from the Hospital for Sick Children, middle childhood champions and parents will also be participating in this event. Time: Drop-in activities are available from 4 to 7 p.m. The speaking portion and performance by children enrolled in the Sistema Toronto music program will take place from 5:30 to 6 p.m.
About 60 children will participate in innovative programs designed to cultivate their imaginations and ingenuity. Members of the media are invited to watch children participate in the Robot Wars and Create your Own Comic activities from 6 to 7 p.m. in the committee rooms. Children and adults can also participate in various activities, including learning how to use a loom from the Textile Museum of Canada and participating in 3D printing by MAKELAB. 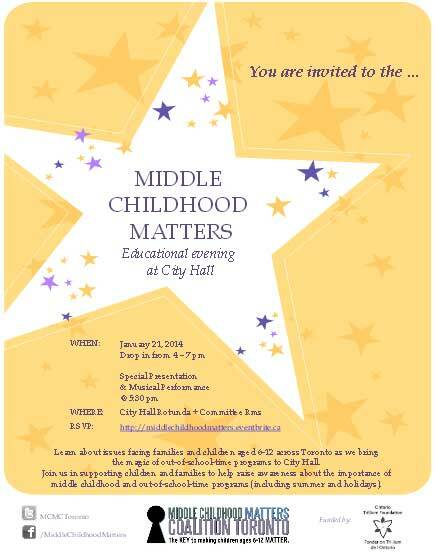 A complete event schedule is available online at http://www.middlechildhoodmatters.ca/portfolio/middle-childhood-matters-edu/.